Eli Attie has written for 'The West Wing', 'Studio 60 On The Sunset Strip' and more recently, on 'House'. Prior to that, he worked for President Bill Clinton, and he was the chief speechwriter for Al Gore, from 1997, right up until that fateful day in 2000, when he conceded the presidency to George W. Bush. How do you think working in politics prepared you for working in television? It seems to me that they're worlds apart, but maybe your experience is different. There's an old joke, which I may have stuck on The West Wing, that politics is dog-eat-dog while Hollywood is the exact reverse. In fact, it turns out that they are indeed worlds apart. I spent my last few years in Washington as a speechwriter, and because that word sounds a lot like "screenwriter" I mistakenly thought the two jobs would be similar. Screenwriting is largely about structure -- what you reveal to the audience, and when -- and also emotion and character. Speechwriting, and politics in general, is a kind of extended argument about the issue at hand. I suppose in both professions you're dealing with some big personalities, but that's true of many professions. I'm lucky I thought they were similar; if I'd realized how radically different Hollywood was I might not have made the switch. What made you decide to move into entertainment, was you looking to get away from politics? It was really because politics got away from me. I was working for Al Gore until the final moments of the Florida Recount. I was angry, burned out, demoralized after a stolen election, and a friend jokingly suggested screenwriting, which I'd never even considered. It was more of a lark at first, I just thought I'd spend a year or two in LA and go back to Washington. One if the most recognizable things about The West Wing, was the writing style of Aaron Sorkin, and of course-- it's not something that can be imitated. Did the writers feel a lot of pressure after he left the show? No question about that. Aaron's an auteur, a singular genius. I think the show generally fell short when writers tried to imitate him, because that can't really be done. For me, Season 5 was a tricky one, but 6 and 7 were incredible television. I enjoyed different writer's episodes for different reasons. I began to recognise the voices of different writers.. for example, an episode by you was different to an episode by Deborah Cahn. But I'm really interested to know how it would work. How and why do writers get assigned episodes; and did you have a lot of input in each episode? In that post-Aaron period, John Wells would choose the writers of the individual episodes, based on a general rotation and also how many episodes he wanted a given writer to do. In my memory, it was usually a fairly blank slate when you got the assignment -- maybe a few plot points that the group had decided upon, but you could really shape the themes and storylines as you wanted (with John overseeing them all and making sure they actually worked). I guess I just wrote about the events and emotions and ideas that had stuck with me from my time in politics, and it was inevitable that the individual writer's episodes would reflect that writer's voice and style. Because of my political background, I did contribute to lots of scripts beyond my own, during all five seasons I was on the show. Some of my favorite storylines were ones I didn't actually write. After The West Wing - were you apprehensive at all about moving away from political material? I was eager to do it, actually, because I'd said so much of what I wanted to say about that subject matter. And at the end of the day, you can't tell a story about politics with the story itself -- a character's overconfidence, a disintegrating friendship, whatever it is that you weave in between the government acronyms. Those stories don't change very much, whether you're putting those characters in the White House, or a hospital, or on a flying saucer for that matter. Well, okay, maybe it's different on a flying saucer. It's still devastating to me how Studio 60 got cancelled after one season. I thought it was fantastic. But what lessons can we take from this? Next time around, how can we make sure the great shows get to stick around? TV is a brutal business. Lots of great shows just don't find an audience, for hundreds of reasons -- marketing, scheduling, whether or not they hit the right moment in the zeitgeist. If I knew the real answer to this question, I'd start my own TV network. Where do your writing ideas come from? What inspires you? The best writing is at least a little bit autobiographical, I think. But ideas tend to come from everywhere -- something you read in the paper, something that happened to you the week before, a song you hear on the radio that reminds you of a time of your life. You just have to stay open to the ideas that are all around you, flying through the air, in a sense -- and it helps to be on a really tight deadline. What music do you like? Do you listen to music when you're writing? I listen to music constantly -- everything from acoustic blues and early Americana to British Invasion to punk rock to modern alternative rock -- but never when I'm actually writing. But sometimes, the mood or idea of a song can carry over into what you're writing. When you were writing for Bill Clinton, or Al Gore, how much of that comes from inspiration? And how much of YOU is in what you write? Not very much of the speechwriter should be in a political speech. You're trying to capture the spirit and pulse and passion of another person, right down to the punctuation. Plus, you have to remember that it's not your intellectual property at the end of the day. 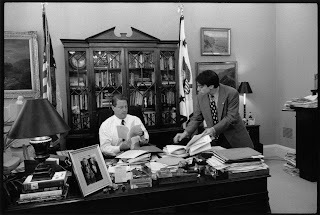 For someone like Al Gore, the speechwriter exists only because he's too busy to be hunched over a computer screen all day. That's not to say you can't have an influence, but that shouldn't be how you approach the task. Have you written any feature film screenplays? Is that something you're interested in? I do have one original screenplay that's set up at a studio right now, called "Smile Relax Attack," but it's a tricky indie-type film and I can't say if it'll ever get made. I've done uncredited rewrite work on some other people's movies, and I'd like to do more original work when I get the time. I still like to hold on to the notion of screenwriting being an art-form. A singular voice. There's something heartbreaking about someone's screenplay getting re-writes, but I realize it's the nature of the industry. Do you think re-writes for the most part improve screenplays, or do you think there are times when they ruin what is on the page? It really depends. Some movies are based on the voice of the author, and all you're going to do by tampering with it is ruin it. Those kinds of movies don't get rewritten very much to begin with. But most Hollywood movies are driven more by plot and action than any kind of voice. Sometimes, a little rewrite work can help a confused plot, or give a character a more distinctive personality, or simply slip in a few more good lines. It's not a bad thing in itself. Even a movie written by a committee can be preferable to one that doesn't quite make sense. How do you, as a writer, get into the head of the characters? If the character is strongly defined, they really can help you tell your story. The good thing about working on a TV show is that you spend hours and hours with your colleagues talking and arguing about what each character should say or do or feel, so you get to know them really well, and that knowledge can spill right onto the page. There's some mimicry involved too; sometimes the actor's voice and bearing has everything to do with how you write a certain line, or shape a certain scene. But often the story ideas start in your own head, from your own experience or observation, and then have to be transplanted into the character's world and idiom. 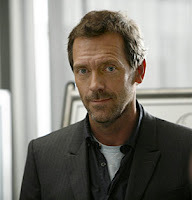 Hugh Laurie has such a specific way of talking in 'House' - is it difficult to get the tone right? The voice of House is very much the voice of David Shore, the show's wonderfully funny and talented creator. I love writing for the character, but David is always right there, making sure the tone is pitch-perfect, and adding hilarious lines that make me look better than I should when my name flashes on the screen. That's hard to say. Paddy Chayefsky, maybe? Mamet? I've of course been lucky enough to work for some of my favorite writers in this business too. Which is why I wanted to work for them. Do you have any plans to create your own show at some point? No specific plans, and I've had such wonderful jobs as a staff writer on other people's shows, but it's something I'd like to try. After your two very different careers -- in which do you think you have a better chance of inspiring people --- television, or politics? I would have to say politics. Because TV and movies are, at the end of the day, entertainment; you should shut them off when the real people walk into the room. Politics can really transform people's lives, sometimes even save people's lives. The greatest episode of the greatest TV show is no match for the creation of Medicare. If Al Gore had made it to The White House, I'm guessing your career would be a lot different now. Is that something you ever think about? If I think too much about what it meant for the country, I'd be in therapy for the rest of my life, maybe even longer. In terms of my own career, you really never know where things will lead. I kind of stumbled into politics, just as I stumbled into Hollywood. Hard to think very much about the past when I barely have a grasp on the future. I also spoke to Eli last year, about John Spencer, who played Leo McGarry in 'The West Wing' - you can read his poignant words HERE. Very interesting and inspiring interview. Thanks for the great read!